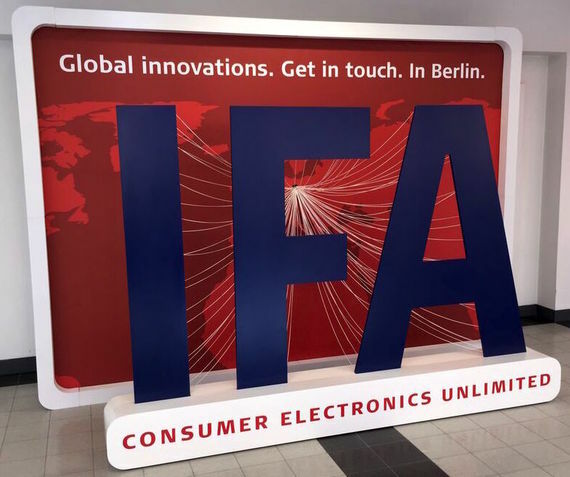 IFA, Europe's version of the Consumer Electronics Show, ended its annual Berlin run last week. Like CES, IFA serves as the launching pad for thousands of new gadgets and gizmos. After wandering around the Messe Berlin fairgrounds for four days, here are a dozen of my favorite new digital gewgaws, plus a bonus pick. You've heard of 4K? Well, Acer's latest Predator G gaming PC, the new Windows 10 G6-710 (October, $2,000-plus), is capable of outputting 12K video. Packed inside the G6 is Intel's new 6th-generation Core i7-6700K chip, an Nvidia GeForce GTZ 980 graphics processor, 64GB DDR4 dual channel RAM and One-Punch CPU overclocking with an IceTunnel cooling system to keep the whole rig cool when you're really pushing the processor. 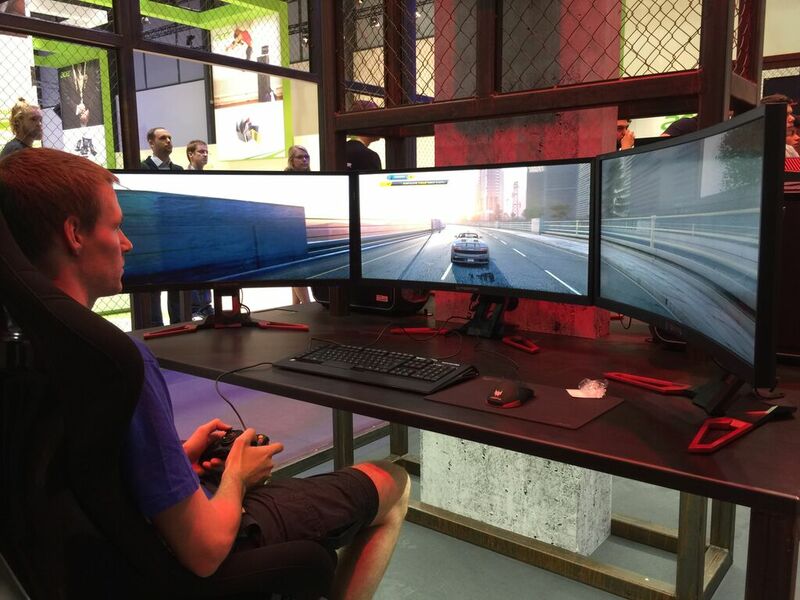 One result of all this computing power is the ability to drive multi-screen games such as the immersive Formula One racing game the company demo'd in its booth on three side-by-side-by-side 4K monitors (3x4K=12K). Go, Speed Racer, go, indeed. 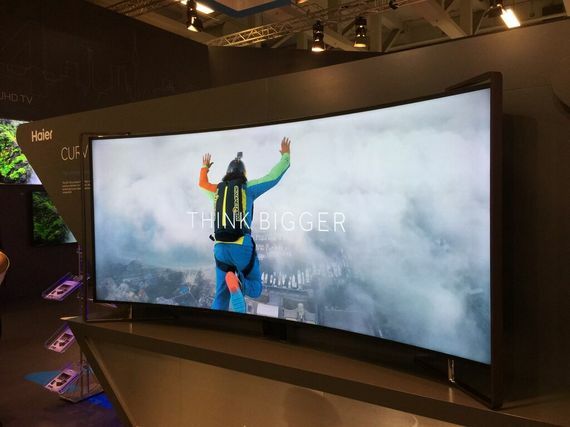 Okay, this is not really a 5K TV, just an extra wide 105-inch 4K UHD TV with 5120 x 2160 pixel resolution. I doubt this set will ever actually go on sale, but let me go on record as saying 21:9 aspect ratio (rather than the usual, more squarish, 16:9) TV becoming the norm - no more top-bottom letterboxing for widescreen movies on TCM - would make me a happy TV owner. 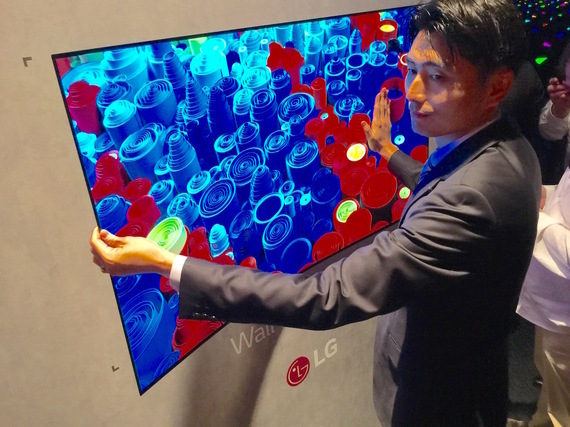 At IFA, LG surprised its keynote presentation attendees by showing off its .9mm thin 55-inch OLED bendable wallpaper HDTV. We're not sure if/when the company will actually sell these wafer-thin HDTVs for us to plaster our blanks walls, but we hope sooner rather than later. Since I can't have a wallpaper TV or a 21:9 aspect ratio TV, this available-now EF9500 65-inch LG 4K OLED ($7,000), intro'd at IFA, is, IMHO, the best TV you can buy. OLED, like plasma, is a far superior technology to LCD LED because OLED's individual pixels can be turned off, so black is totally black and make colors jump out of the screen like on a black velvet painting. By comparison, the always-on backlighting on an LED turns blacks into dull charcoal or grey. Plus, this OLED is just 4mm thin and flat - curved TVs are marketing BS and actually increase reflection of ambient light and cuts down a TV's viewing angle. This is the TV I've been waiting for. One day I may actually be able to afford it. GoPros are great and optical image stabilization is nice, but your action footage will always be a bit jerky and jittery. What you need to produce startling and smooth - and, therefore, actually watchable - footage is a Steadicam for your mobile phone or action cam. 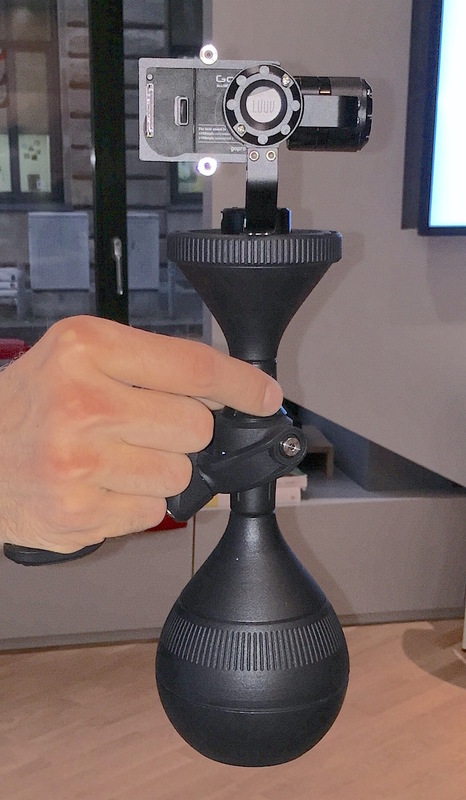 Presenting Luuv (and apologies - the site may be in German), the "Steadicam for everyone." Luuv is actually two modular pieces, a stable mechanical main unit (fall, apx. $109) and an added electronic gimbal (apx. $218) that really provides unique POV shots from seemingly impossible angles. A Kickstarter campaign begins September 22, during which early contributors can buy themselves Luuv for half off. Your iPhone or Android smartphone has a music player - whoopee. But even with its iPod legacy, the iPhone is not really a music-centric smartphone. 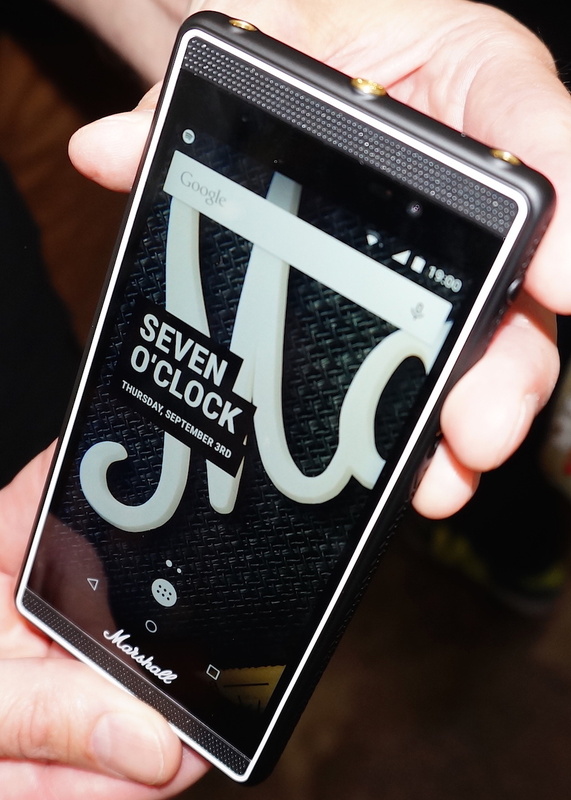 But the new Marshall London smartphone sure is. On the hardware side, London is equipped with front-facing stereo speakers, a dedicated music-access button and two headphone jacks, each with individual on-screen touch-enabled volume controls. You can play music from four pre-installed sources: what's in London's memory, or from Spotify, SoundCloud or Mixcloud music streaming services. And you can shape your music's sound via an on-screen EQ, for which you can save specific settings. Spec-wise, the Android Lollipop 5.0.2 London features a 4.7-inch 1280x720p display, 16GB of internal memory with a 64GB microSD card included. London is available right now in Scandinavia (it was designed by a Finnish firm) and will hopefully arrive in the U.S. sometime soon. For some sensitive ears, listening to compressed music from a smartphone is akin to listening to mewling alley cats. HiRes Audio seems to satisfy the audiophile digital music listener, but HiRes players have been, well, boring. 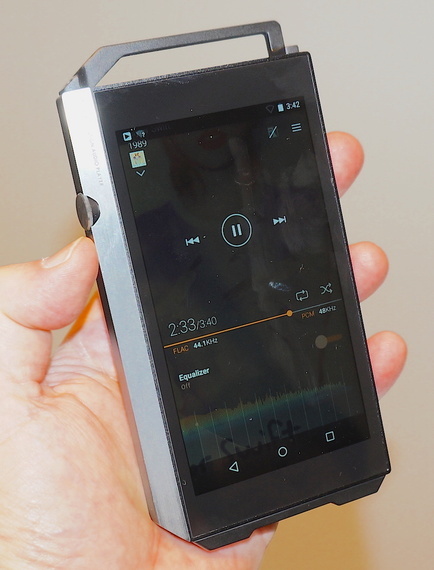 Enter the smartphone-like Pioneer XDP-100R, a HiRes audio player that runs on Android Lollipop 5.1.1, and which features a 4.7-inch 1280x720 screen as well as a potential 288GB of memory, and is constructed of a tough anodized aluminum body, but weighs just a surprisingly light 200 grams. More importantly, the 100R plays back uncompressed (or nearly uncompressed) DSD (Digital Stream Digital), WAV, FLAC and non-DRM'd Apple Lossless files, and is the first to offer the hot new MQA (Master Quality Authenticated) format. The 100R will first be available in Europe in November, in the U.S. "later" at a yet to-be-announced price. Around a third of IFA's show floor space is annually occupied by appliances, especially coffee makers - come thirsty and tired, leave sated and wired. But perhaps the most fascinating new appliance at IFA was this AddWash front-loading washer from Samsung. Like a washing machine nesting doll, there's a little door inside the big door; just push a button to pause your already-started cycle, then toss in that one sock, towel, T-shirt or tightie-whitie you somehow forgot to originally load. The AddWash washer also includes the company's ecobubble technology, which lets you wash equally effectively in cold water as in hot. 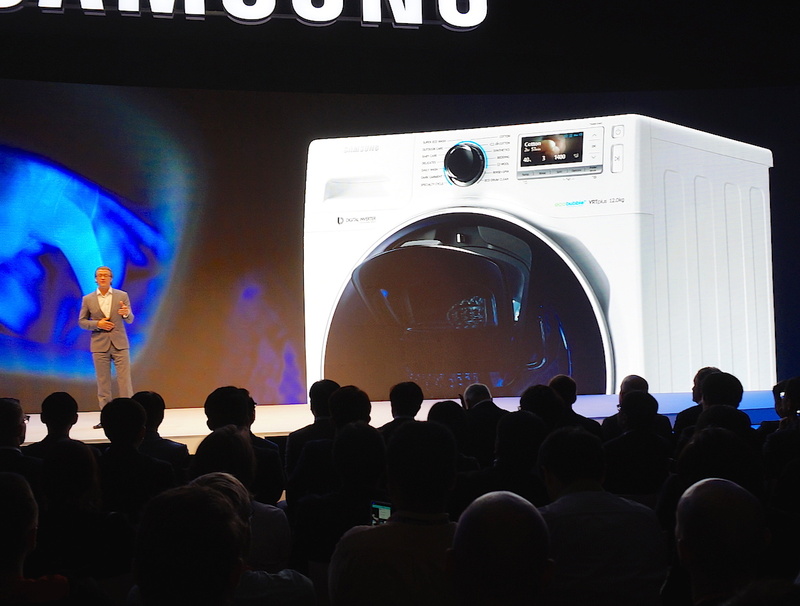 The AddWash machine is already available in Korea and is due in Europe by the end of this year. Oddly, though, there wasn't one on the show floor. The great undiscovered country in gadgetry is the LED light bulb. 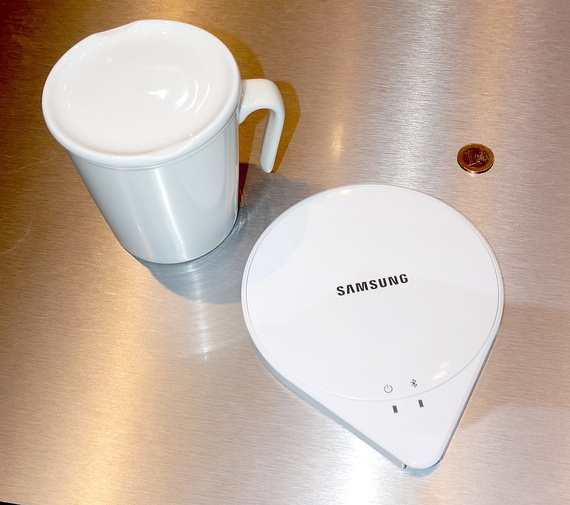 Here is a device filled with circuitry that is always plugged into AC and so can be adapted for a variety of uses other than just lighting, such as doubling as a wireless speaker. 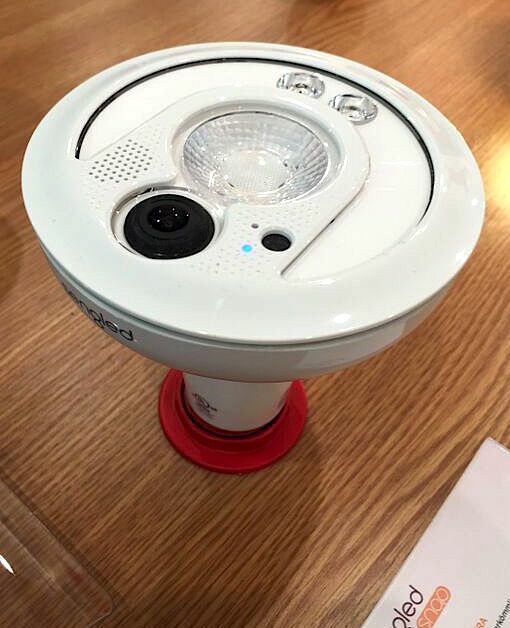 Sengled recognizes this tabula rasa potential and has added an HD surveillance camera into its new Snap (October, $149.99), a 60-watt-equivalent LED bulb, designed to be screwed into a ceiling can. The integrated HD camera/camcorder has a circular 140-degree viewing angle, face detection so it can recognize your family members, and a motion detector. It's controllable by the pending MySnap app and HD footage is stored in the cloud. Oven range hood fans are handy for clearing out cooking smoke, but are unsightly and take up space that could be better utilized by cabinets. 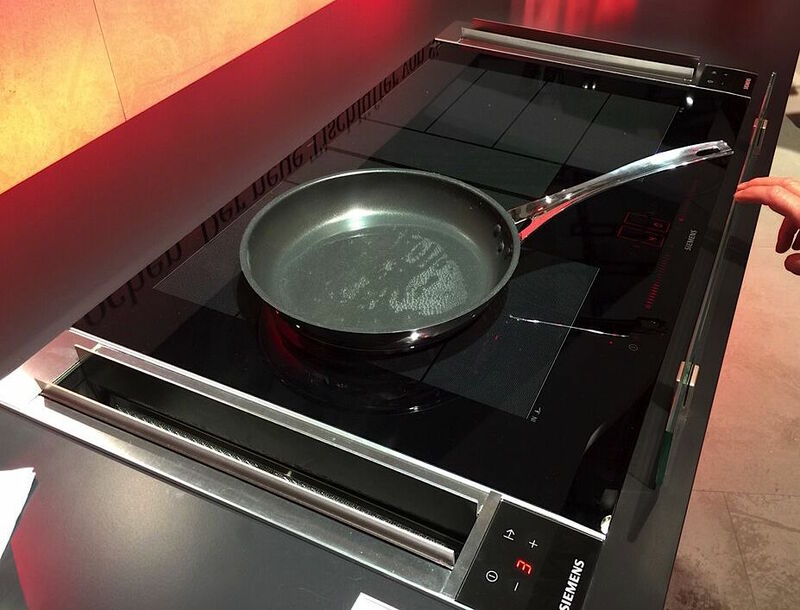 Siemens solves this smoke sucking space situation with its ventilation countertop, with vacuum vents on the side of the stove instead of overhead. Each vent will run you around $2,500 when the system becomes available next spring. This white ping pong paddle-shaped slab is either cool or creepy. The SmartThings SleepSense slips under your pillow so it knows when you are sleeping and knows when you're awake. Depending if you're getting up or dropping off, SleepSense can trigger a series of actions depending on which condition you're in, such as lights dimming or lighting, shades going up or down, the coffee maker starting up, the TV going off. The questions are, when and how much (SmartThings didn't say), and what happens when you get up in the middle of the night to pee? Oh, it also monitors your sleeping metabolism to improve your snoozing habits. Sound is every bit as important as the visual if you want to be engrossed in the most recent superhero or space blockbuster or violent video game. But setting up a Dolby Surround Sound system, with all that rear-speaker wire stringing, can be a pain in the ohms. 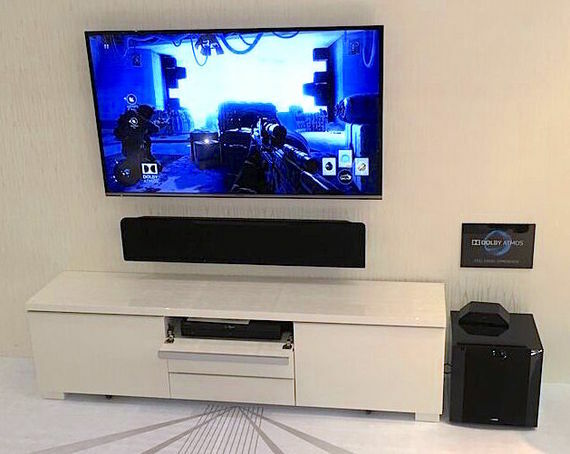 Soundbars and sound plates are superior to the sound of your TV, but their placement in front or under the TV can't deliver truly encompassing audio. Enter the Yamaha YSP-5600 (December, $1,700), the first soundbar - or "digital sound projector" as Yamaha calls their versions - imbued with the 7.1.2 Dolby Atmos technology. I got a demo at Yamaha's IFA booth and, yup, with sound bouncing off the walls, floors and ceiling, you hear surround sound FX behind you and over your head. You'll also be able to add an extra surround oomph with an added wireless subwoofer ($150). Panasonic and Samsung both exhibited prototypes of their next-gen 4K UHD Blu-ray player at IFA, the former behind glass. 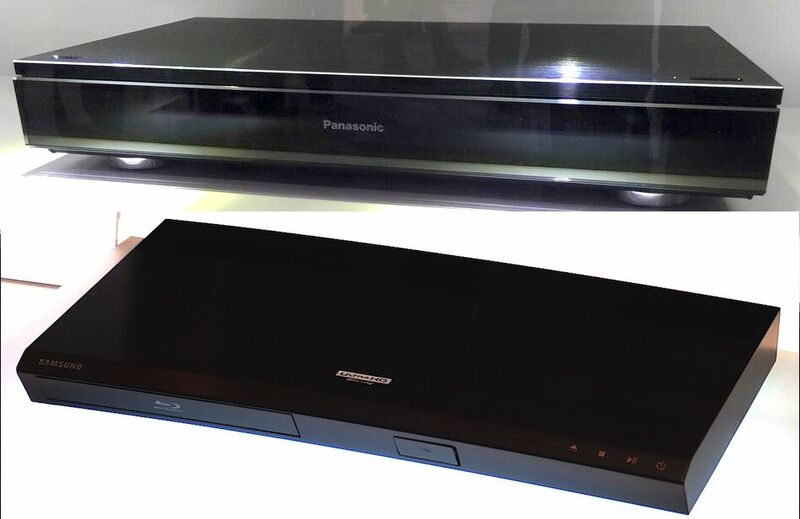 Panasonic might start selling its UHD Blu-ray deck before the end of this year - might - but Samsung and other potential UHD Blu-ray makers will likely stall delivering them until next year. 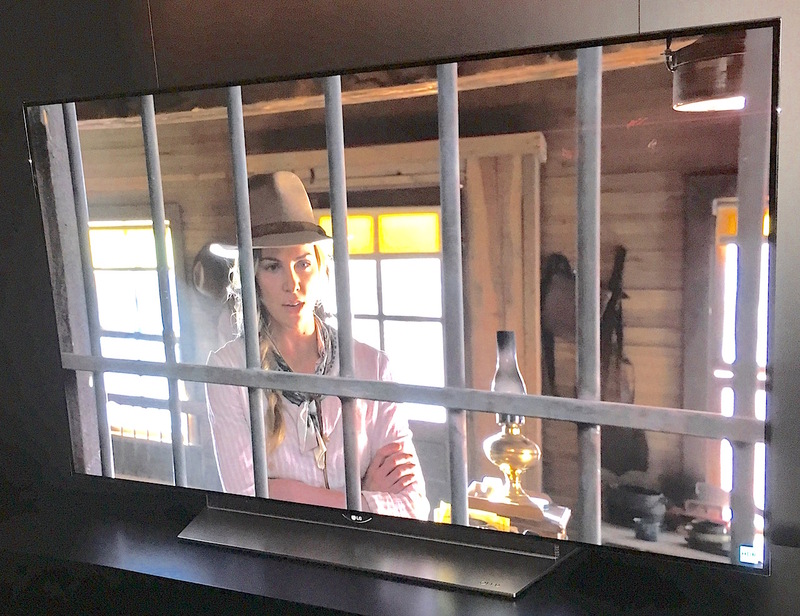 Other than the obvious advantages of both 4K and HDR contrast enhancements (assuming you have an extra-large 4K TV that will allow you to see these image improvements - and 55-inches is not "extra large" enough for see the benefits of 4K, but I digress), the best UHD Blu-ray feature may be SeeQVault. SeeQVault is a secure content format that lets you copy a UHD Blu-ray movie you bought onto a secure SD card to then transfer it to another device. No more illegal ripping or morally questionable BitTorrent downloads for the cheap and morally ambiguous among us, or no more paying for the same movie multiple times for the cheap and morally unambiguous.